Guest post by Siya Natseva. Follow Siya on her blog, PumpUp (@cinnamonontop), and Instagram/Tumblr cinnamonontop8. While the notion that there’s a wrong way to keep fit is foolish and you shouldn’t let anyone tell you otherwise, people differ in their approach to exercise. Some are loners, quite content to be active on their own. Others thrive in a collaborative environment (this is not a job application, I swear). Personally, I am a recluse and prefer going it alone! As such, I’ll brief you on its advantages and disadvantages. Will you switch teams, or will you stick with your original choice? Let’s find out! 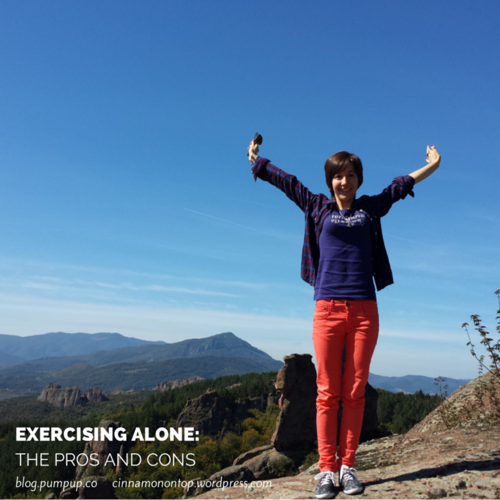 When you choose to exercise alone, you don’t depend on anyone but yourself. With people’s individual schedules in the equation, it may be difficult to arrange a workout session convenient for you and your companion. Going it alone gives you the opportunity to be your own boss. If you fail to plan ahead, you’ll fail at your workout. With no one to point the finger at, you’ll learn to manage your day better. A few failed attempts and you’ll be a pro at handling your chores in a way that allows you to exercise regularly, at a suitable for you time. Friends often decide to team up for the completion of their fitness goals, only to discover that their objectives are either incompatible, or their mate’s pace is acutely different. Are you a yogi and is your pal training to be a boxing champion?To avoid disappointment, enquire about your acquaintance’s ambitions and their progress. Alternatively, you can concentrate on you and train at your own pace. You shouldn’t have to slow down or play catch-up. Buddying up shouldn’t be a competition. Without the added stress of ‘Am I too good? / Am I good enough?’, you’ll achieve your projected ends easily. Company may be your free ticket to Distraction Land! If you’re a chatter box, and / or so is your partner, your dedicated gym time may turn into a coffee break. In contrast, being alone automatically eliminates the possibility of distractions. A random chat with a fellow gym junkie is fine and can’t be compared to a full-fledged conversation about a mate’s relationship status on FB. Being aware of how long you can train for pushes you to think wisely about your programme. Thus, you’re effective and efficient. The prospect of pumping iron - or whatever your session may consist of – unaccompanied may, on the one hand, be intimidating. On the other, it probably sounds awfully boring to some. If you’re a person who needs consistent breaks for a high-five and a few encouraging words, you should perhaps steer away from the hermit-like character of working out by yourself. Boredom is the worst thing you could associate exercise with, because you’ll be giving up in no time. Keep it fun! Have you reached a plateau in your fitness routine? If so, exercising on your own may not be the best option for you either, since you’re facing the risk of quitting. I’m not suggesting fierce competition, but witnessing another’s progress and dedication may inject some much needed inspiration. If you lose your drive, despite having seen results, you may be tempted to throw everything out of the window. With someone next to you, those terrible thoughts will evaporate! Linked to our previous point is the determination to actually improve. We PumpUps are a greedy bunch! With us, there’s always the wish to be better, faster and stronger. Some may handle this well without external assistance, but others may be at a loss. With companion – preferably somebody slightly more advanced – you’re guaranteed to reach higher!